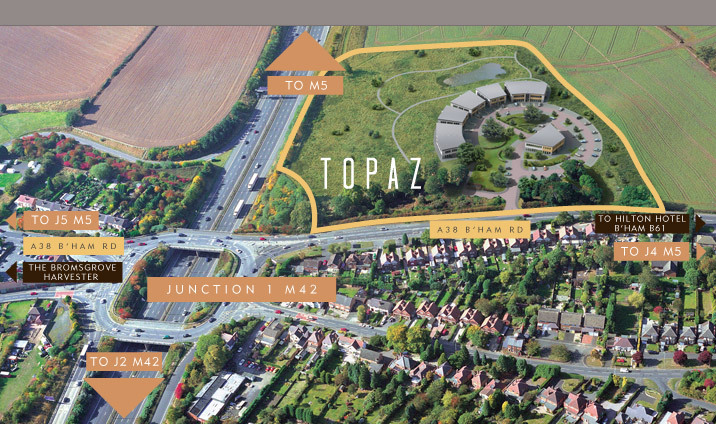 TOPAZ IS ADJACENT TO JUNCTION 1 OF THE M42 AND PUBLIC TRANSPORT SERVES THE SITE EXTREMELY WELL. Train services are available from Birmingham International and Birmingham New Street. Birmingham International Airport a convienient 28 minutes drive away. Topaz is also within a stones throw of a number of amenities and attractions including the Bromsgrove Harvester and the Hilton Hotel.